Inquiry-Based Learning: Organizing for Inquiry Learning! In my previous blog (here), I wrote about our daily schedule and explained the day in the life of our inquiry-based classroom. This post, outlines how we get started with an inquiry and how we organize the workstation block. First, we spend up to two days building background knowledge, interest and curiosity around the content area that we will be exploring. 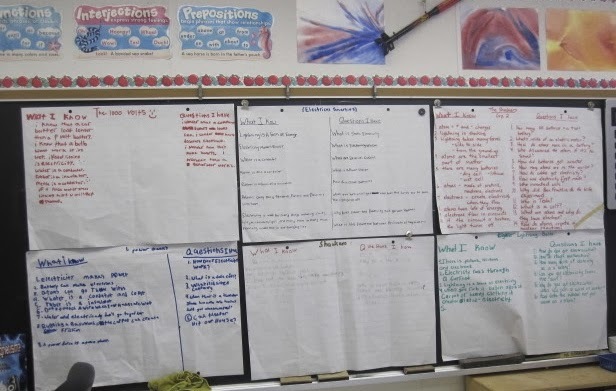 During this time, the class builds a bank of questions and a list of vocabulary words that are connected to the topic. Next, teachers create activity cards that are built around the questions and interests that the students showed during the background knowledge building. These activity cards are designed to be open-ended and to allow for creativity. The students are provided with a large block of time to complete the activity with the goal to present at the end of the day. 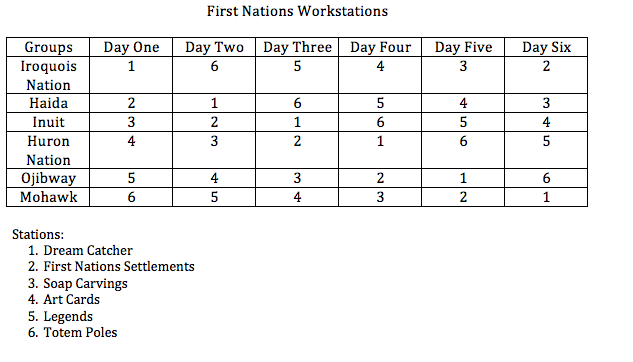 The following chart is an example of how the groups (4 to 5 students per group) rotate through the stations. For this unit, we let the students pick their team members, then they picked a name connected to our topic. The list below is a summary of the activities we used for this unit. More information about this unit can be found on our website - http://www.inquiry-based.com - Take a look under the Social Studies Lessons tab. 1. Dream Catchers. 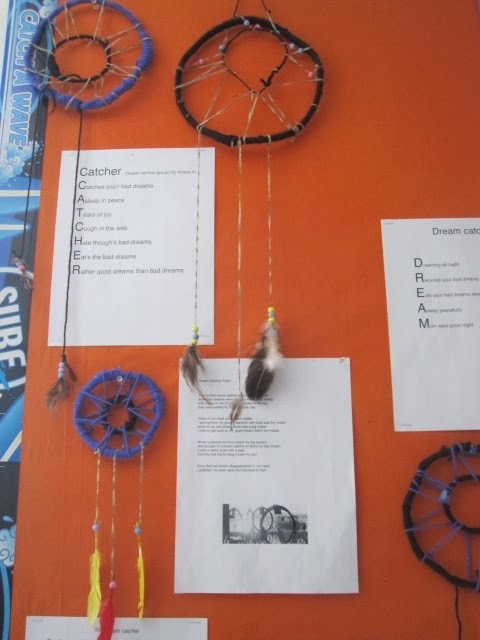 Create a dream catcher, research its origins, and write a poem. These can be easily created using found materials, some wool or string, and items from home. There are dozens of good suggestions online for creating dynamic dream catchers. 2. First Nations Settlements Diorama. This is fun for the students to research. Have a list of dwelling types for First Nations groups, or have your students research. Using any of the many materials available commercially or home-made, have the students create dioramas. If time permits, use stop animation software to film figures moving through the diorama and to create short movies that tell a tale of life at the time. 3. Soap Carving. Using soap blocks and simple plastic or wood carving tools, design and carve a 'soapstone' sculpture. Combine them with members of your group to tell a story or relate a legend. 4. Art Cards. Combine poetry and visual arts by creating 'Norval Morrisseau' pieces that have a theme supported by text. Have the students write stories or poems that are depicted in their piece. It could take the form of a legend of how something came to be, or a lyrical poem. 5. Legends. Comic Life is such a wonderful app that supports both text and graphics in a graphic novel format. Students who are more visually talented may find the lower emphasis on text appealing. Students can write and produce a Comic Life piece that is as detailed as they desire. 6. Totem Poles. The students love anything that lets them get their hands on building materials. There are dozens of totem pole creation ideas, from highly elaborate carved pieces to more simply constructed poles using construction paper and glue. 'Pinterest' has dozens of great activities to get you started and great photos to show your class as examples. Each member of the group can be responsible for an addition to the whole. The students can write short pieces about the characters that tell a story about the life of the First Nation group they are studying. They are not limited to the Haida, for example, because all First Nations peoples' stories can be told by using any appropriate figures. The totem pole simply becomes a story-telling vehicle. The students really enjoyed this unit. The classroom was buzzing with learning, curiosity, interest and creativity. How do you organize for student inquiry? Thank you for sharing your wonderful ideas online! I used the first few lessons that were featured on tribes and biographies on First Nations people, and they have gone over so well with my students. We love to hear that people are using our website. Hope you will share your experience with us.